Over the past several decades, our seawalls along the Northwest Arm, including Horseshoe Island, Regatta Point and the Dingle, have deteriorated. In the last decade, the severity of storms combined with sea-level rise have exacerbated the condition of the walls and the issues came to the point where major restoration work was required. The seawall at Sir Sandford Fleming Park (Dingle) has seen the most damage. It is more than 60 years old and was built using traditional methods, which did not take into account the rising sea levels. After severe storms such as Hurricane Juan, we hired a consultant to evaluate the damage to the walls and paths due to flooding, wave actions and sea-level rise. The distinct, quarried stone seawalls were evaluated to determine how to rebuild them to last for another 100 years. The study took into account storm waves, high water levels and anticipated future sea-level rise and other climate changes. The consultant report conducted by Coldwater Consulting, entitled the Northwest Arm Shoreline Restoration Study Technical Report can be viewed atwww.lindamosher.ca under the news tab. After the consultant was finished with their evaluation, I held a public meeting to present the various options the consultant provided to rebuild the wall. The vast majority of residents indicated their preference for rebuilding with natural granite versus an engineered wall. The natural granite walls are the most expensive option, but are aesthetically pleasing and reflect the historic integrity of the Northwest Arm area. As per the other phases of the seawall restoration, the wall will be made of granite stone. It will be approximately 120 metres long. The height of the wall will be increase to the same elevation of the wall of the previous phases, along with a three-metre-wide asphalt trail. Two culverts will be replaced along the wall. A third culvert will also be replaced along the trail leading up to the wall (approximately 70 m to the southeast). 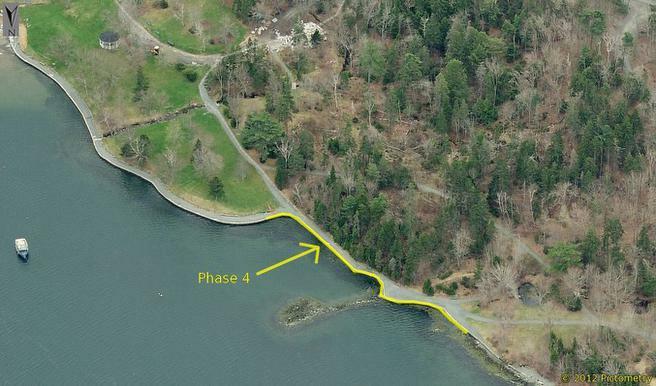 Work on the seawall will commence in the fall. The seawall at Regatta Point has continued to deteriorate and HRM is completing a coastal assessment of the walkway to develop solutions and cost estimates. Staff anticipates a report by September with recommendations on shoreline and walkway protection measures. Wave action and seawall protection will be examined as part of this work. Funds will be recommended for the capital budget. We are also repairing the boat launch at the Dingle as part of the same tender as phase four of the seawall replacement. The seawall, which is being replaced contains several pieces of granite curb stone. We will be recycling this material as the new boat ramp surface. Generally the work involves replacing the existing concrete boat ramp surface in the same location. Construction for the boat ramp is also scheduled for the fall of 2016. There will be considerable activity at several areas within Sir Sandford Fleming Park at this time: construction of the new natural playground, seawall restoration and new boat ramp surface, so please plan your outings in the park accordingly.